Could you please add the ability to pair an iPhone using Apple’s ‘Remote’ software application (available free from the iPhone AppStore) with Firefly Media Server for linux? i second that. please add such a feature. it’s extreme stupid to run the itunes application on a pc, if we can play it through firefly on the nas. If rpedde is correct, that it’s encrypted, then how about this? once logged in, itunes is saving the validated code in the xml file. maybe we can copy it? Rename a firefly instance to the same name as the Itunes library had, and use the code? All the details needed, and it’s really trivial as it turns out. But I don’t think it’s the job from mt-daapd to get accessible by the remote-app. 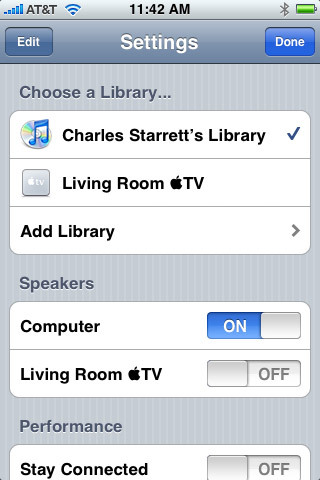 The remote-app doesn’t transfer any music to the touch or iphone, it only controlled the iTunes-Programm. Unfortunately you can’t acess music from shared libraries in the controlled iTunes, but this would be the job from iTunes or the remote app. Maybe a dumb questions, but I am also not quite sure, whether this all could work. As the firefly server should only provide access to a music library, which could be included into iTunes, I am confused about the fact that this server could be made accessible for a connection to the remote app in order to play music on another client like the airport express. Thank you for a little explanation to this problem. Although I’m new to the forums, I’ve been using mt-daapd for years now, and the feature set has seemed to change from duplicating what iTunes did at the time, to transcoding unsupported files and creating a web-based management interface, to talk now of integrating a flash-based player into the web interface to allow you to listen to your music anywhere. This feature request is moving in another direction — with local playback. After perusing through the apparent handshaking that’s taking place with dacp, I initially thought a LAMP server with syscalls to mplayer could totally handle what you need. The trick would be building and managing the library — the actual controls are pretty trivial. But, you know, after realizing that, I’m looking at mt-daapd, with a nice, organized way of making calls to the library. Adding the ctrl-int stuff would only be a matter of implementing extra functions. Although mt-daapd wasn’t conceived or ever designed to do local playback, it really wouldn’t be as hard as you think. Granted, it would be a lot easier to implement *dacp-like* controls initially. And maybe use some PHP scripts to control it through a Web-based interface. And last I checked, iPhones have no problems browsing Web sites. I could picture tossing the server in the living room hooked up to the stereo, and using a WiFi-enabled PDA or a tablet PC or something to control it. However, I have to say, although this wouldn’t be difficult to do, there *are* other projects out there that are doing, basically, what you’re requesting — to control your computer’s playback. I haven’t used Ampache for a while, but last I knew, it had a local-playback option, using (at the time) mpeg123. Of course, this isn’t really what you want — you want to control your library using your iPhone’s nifty program to do such. You may have to settle on a web-based control until the protocol matures enough for there to be other (non-iPhone) clients that can use it. beside controlling the playback via the remote application, another issue have to be considered. Why is a PC needed to play back music from a NAS? Can’t the NAS stream directly to an Airport Express, controlled by a web interface?